A living legend at 86 (photo taken in about 1968), Clyde traded in his teacher's chalk for a mountaineer's axe nearly half a century ago. His unmatched knowledge of the rugged Sierra Nevada backcountry helped him reach many lost climbers and downed airplanes over the years. Norman Clyde traded teacher's talk for a mountaineer's ice ax nearly half a century ago. His unmatched knowledge of the rugged Sierra Nevada backcountry helped him reach many lost climbers and downed airplanes over the years. 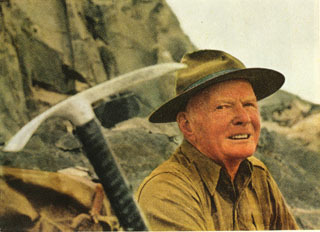 He is pictured, at the left, when he was 86 years old and still an active climber in the Range of Light. A resident of Owens Valley and true pioneer, Norman Clyde has climbed more peaks than any other mountaineer of the Sierra. So many of his climbs were first ascents that it makes mountaineers envious. 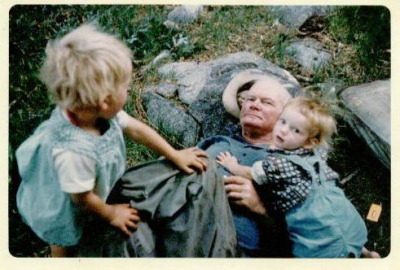 Nature lover, teacher, and writer, he has been a keen observer of the wild life and the flora of the Sierra. 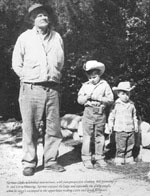 Norman resided in Big Pine, in Inyo County, for most of his life where worked on his stories of the Sierra. For decades the spokesman of the High Sierra, or the Range of Light as us romantics prefer to call this majestic mountain range, was John Muir. When John Muir died, a young high school principal, Norman Clyde, in Independence, CA. began to write about the Sierra. 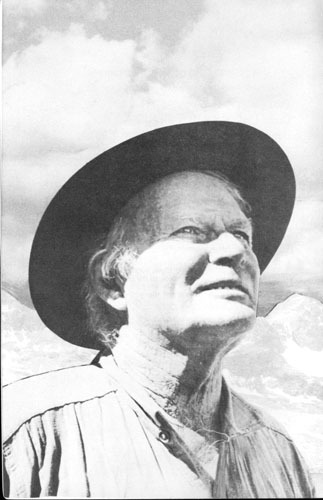 The spectacular backcountry with its incredible mountain vistas, meadows filled with alpine flowers, rugged 14,000 foot peaks, mountain lakes and streams, and plentiful wildlife captured his heart and his pen. 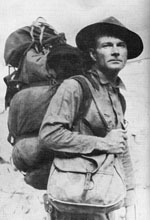 In the 1920s he began to write of his experiences hiking in John Muir's "Range of Light" and of his many first ascents of the Sierra mountain peaks in local newspapers and national magazines. The young school teacher spent every possible moment on his beloved summits. Soon, he had no time for the teaching of unwilling students and devoted his entire time to scouting, climbing and writing. Many of these stories were first published in the Southern California Automobile Association's magazine, Touring Topics (now Westways). View from the window at Glacier Lodge towards the Palisades. 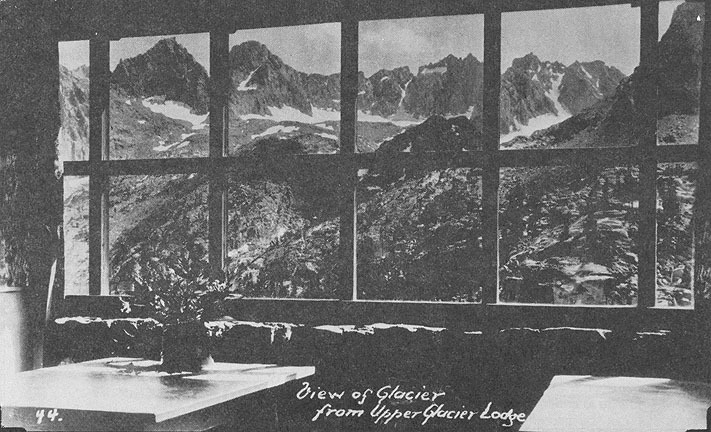 In 1946 Glacier Lodge had a goodly share of interesting personalities, among them Norman Clyde. 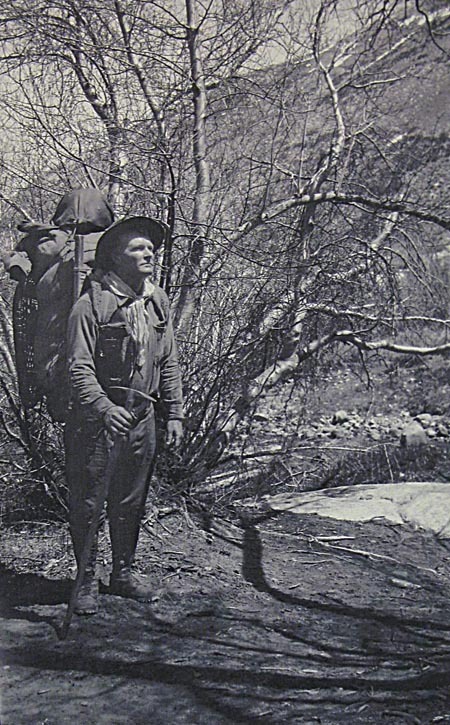 Norman's mountaineering skills in the Eastern Sierra had gained him international fame. 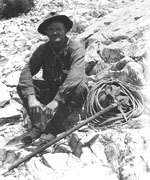 Guests hiking through the lakes near Glacier Lodge in the Palisade Glacier area might find him at "Eagles Roost" or "Palace Hotel," his two private camps, where he rested between expeditions. The major peak directly west of Glacier Lodge is officially designated Mount Clyde, and there is also a Clyde Minaret in the Mammoth Mountain Area. Norman Clyde on Tower Peak in 1940. 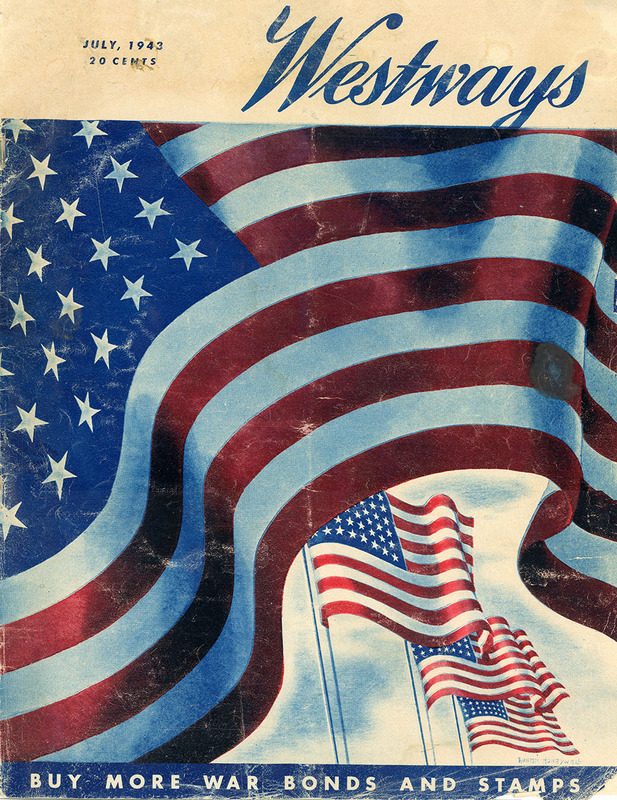 Norman Clyde was a schoolteacher in Independence, CA. He was a rather secluded individual not particularly liked by the students. One Halloween, some of them decided to bother him by pounding tin cans and making other loud noises, He asked them go away several times and when they didn't, he fired his gun into the air. When the school board and townspeople learned of it, his teaching license was taken away and he became a mountaineer, writing articles and books. It made him a very meager living but he found rest in the solitude. Words "tough", "Unapproachable", "introvert" and "isolated" are often associated with Norman Clyde. Not so, says Lisa Parker Carson. Norman Clyde was a frequent visitor of the Parker family while they lived near Bishop in the 1960s. To show his appreciation for a hot meal and family surrounding, Norman would always bring some fire wood to the Parkers. Lisa, who was one of five children in the family, recently sent me her recollections of Norman Clyde. She remembers climbing over him or bouncing on his robust belly while he patiently sat in his chair. She even used Norman's bald head as a canvas for her "artwork", and he would not utter a word in protest and even seemed to enjoy it. I would probably have had some doubts about her story had Lisa not also sent me a couple of pictures from her album that vividly supported her memories. Meet the Norman Clyde that you didn't know about. Hope you enjoy Lisa's story and pictures. Making "out of print" and "hard to find" books easier to find.